In the TV industry everyone is constantly searching for ‘the next big hit.’ For a brief moment in time, Rising Star perfectly fit this description. Within days of the Israeli launch of the first season, the format had already sold internationally to major territories. Rising Star boasted a first of its kind audience participation and a real-time live experience. This caught the attention of producers, executives and creators everywhere. This was a game-changing concept, set to shake the genre of reality singing competition shows to the core. The case study discussed in this paper examines the creation stages of a transmedia television format, the strains effecting its development, its rapid global roll-out and the international adaptations, primarily the failure on the US market and its negative ripple effect. With that in mind, the case of Rising Star (2013–; Hereafter RS), a spin-off of sorts, conceived moments before the axe fell on ASIB, becomes a retelling of the Phoenix’s rise from the ashes. In order to discuss RS’s conception, it is essential that we first revisit ASIB whose later seasons followed an Idol-esque format. Kicking off with nationwide auditions before moving on to ‘boot camp,’ and finally, culminating with the live shows where weekly eliminations take place until the team has been streamlined to the final three. By the time ASIB’s 10th cycle debuted in May 2012, audiences’ waning interest was evident, and in its aftermath the season as a whole was dubbed a ‘sour grape.’13 Viewers had moved on from themes of nostalgia and Israelism, whilst the media pleaded with production to “Spare us the Israeli Classics.”14 Moreover, with the advent of new technologies, gone were also the public’s mass text-voting days. Were years of on-screen harmony doomed to end on a flat, pitchy note? To understand the circumstances, which led to the inception of RS, one further needs to acquaint oneself with the key players at the helm of Israeli broadcasting and television production. Tedy Productions, the studio behind ASIB, has long since maintained a close-knit relationship with Keshet, the programme’s broadcasting corporation, underscored by years of collaboration, trust, and solidarity. With the genre landscape radically changed, Tedy Productions, along with their partner and commissioning body, Keshet, faced their biggest challenge yet – how to revitalise and reinvigorate their top cash cow’s format? It would be months before the retooled ASIB format would go on to become RS. Genre Fatigue. It had been over a decade since the Reality singing competition became a global phenomenon. By 2012 audiences were well-versed in the genre’s formulas and viewer-manipulation tactics.17 Whether it was the editing of an audition segment (dramatic vs. comedic soundtrack) or a contestant’s backstory (showing tear-jerking footage from home), viewers could now quickly and successfully predict whether this contestant was sticking around for the long haul. “Shocking twists” became about as shocking as breakfast cereal. Judges’ critiques felt scripted and repetitive. As for the viewers? They were quite simply fed up. Seasonal structure. The structure of a Reality singing competition cycle is inherently flawed. Viewership habitually declines when the nationwide auditions move on to boot camp/judges’ houses/Hollywood week (as per programme), and it is only when the live telecasts kick off, and with them, viewer eliminations, that numbers begin to tick back up. As it stands, the main function of the competition’s second stage is to separate the wheat from the chaff ahead of the live shows. (see Figure 1). Predictability. Seasoned viewers had also grown weary of the templated drama which traditionally peaks only at the very end of the live results show. On the Israeli ASIB, the once tension-filled moment when the envelope containing the evening’s results was handed over to the host, had become a sequence so predictable, viewers could lip-sync the host’s every hyperbolised word. Voting method. ASIB deployed text voting and online voting through its website. Text voting had been on a steady decline across all reality programmes. The website seemed outdated as new viewer-engagement platforms were appearing. However, it was through observing social media that development executives at last had their ‘Eureka!’ moment. The understanding that virtually anyone could appoint themselves judge and tastemaker on these platforms (predominantly Facebook at the time), helped development chiefs come to the realisation that viewers were demanding far greater control be placed in their hands. It was becoming obvious that the focus must shift from the judges and their critiques, for in this genre contestants are ultimately judged by viewers at home. To let viewers fully participate requires giving them the reins from day one. The live auditions were thus created, a game-changing shift in the genre. The successful marriage of viewer votes and live auditions effectively shook up the reality singing competition’s traditional structure to its core. For one, it meant all musical performances during all stages of the competition were now judged by viewers, rendering every performance a television ‘do-or-die’ moment. Furthermore, in terms of genre fatigue, this shakeup gave the format a whole new lease on life. Instead of idly waiting for some dramatic faux-climax at the tail end of a telecast, high-stakes drama was now part of every performance (with 10 acts featured per episode). Finally, predictability was all but gone. Live, viewer-voting became the programme’s main driving force, impacting contestants, viewers, and production. All in real-time. In order to have viewers engage live with every episode, the technology too needed a makeover. It was evident that app-voting was the only way to go. Another first for the emergent format was the way real-time app-voting results were integrated into its DNA via RS’s interactive onstage screen (see Figure 2). Figure 2. Selling the RS format: the iconic format image. With viewers now handed almost complete control in real-time, a new reality was formed. There was no show without the people at home actively participating, and therein lay the heart of the revolution. In no way was this Keshet’s attempt at boasting their newest ‘gimmicky’ tech-toy, but rather the potential dawn of transmedia, interactive viewing. With these innovations in place, it was time to shake up the actual studio. The new law of the land dictated that contestants perform live for the viewers and be judged by them, in real-time. With that came the need for a narrative apparatus in the form of a physical partition between contestant and audience, which could only be lifted if the former has won the latter’s hearts. A massive screen was promptly erected. It was decided that contestants would perform alone on stage with the screen separating them from the studio audience. Meanwhile, visuals of incoming votes would fill the screen as the audition played out. The screen would only rise should the contestant have won enough viewer votes; an emotionally cathartic moment in which the darkness and intimacy of their performance would be met with the stark contrast of a vast studio and audience cheers. Later, live onscreen images of viewers at home voting in real-time would be introduced as a further incentive to participate and vote. The programme now had its pivotal major TV moment in the bag – the ‘curtain’ rises - and the hopeful individual is met with wild audience applause: a life transformed. Making a live telecast completely dependent on real-time app-voting requires changes in the production team as well. There are many new crucial tasks from editing the app content and keeping it in sync with the show, to controlling the massive volume of concurrent data flow that is the live-voting. Supervising this entire operation called for a new position and thus the role of Digital Showrunner came into being. It began to emerge that Tedy Productions’ and Keshet’s uncompromising development efforts were beginning to bear fruit as a new format was born. The now, heavily-retooled, digital-centric ASIB was gradually taking shape. What is more, it was clear that a new name, one that would be on par with the overhauled concept was needed. The die was soon cast and the franchise was rechristened, Rising Star. One must now turn the eye outwards and explore the state of the local and global television landscape around the time RS was conceived. In 2011, US premium cable network, SHOWTIME, debuted Homeland - an adaptation of Israeli Keshet’s Prisoners of War, to surprisingly high ratings,21 that were soon followed by several award show triumphs.22 This served as a turning point, making it clear from both a creative and business standpoint that the local industry’s focus should shift to content-exporting. 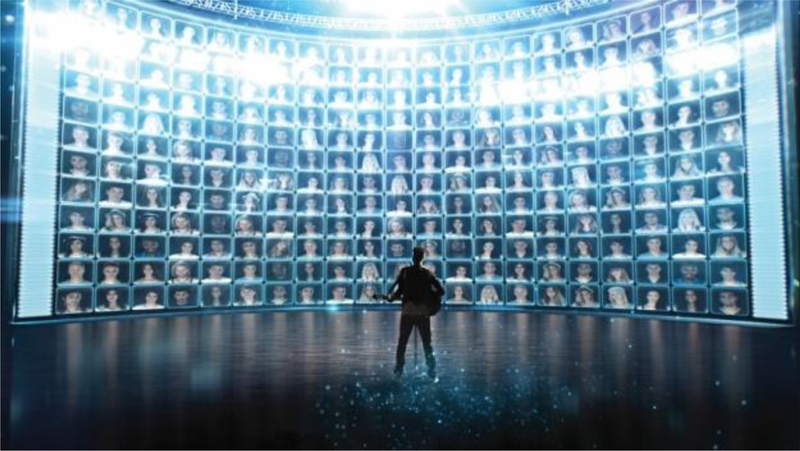 The programme is broadcast live in its entirety with contestant auditions dubbed the ‘live screen test.’ On the screen facing the contestant, images of viewers at home who have been voting for them gradually appear; a mode of viewer-involvement later branded, ‘TV App to you.’ When the contestant hits their target (70 percent of votes during the audition stage), the screen rises, and the studio is revealed to the contestant for the first time. Each performance starts with pre-recorded audition footage before moving on to the live telecast. The four judges or ‘panel of experts,’ as they are referred to, also cast their votes during the live telecast. Each judge’s vote is worth seven percent in the grand tallying of viewer votes. If the 70 percent threshold is met, images of the judges who had also voted for the contestant will also appear on the screen. The second stage of the season finds contestants facing off each other. Once paired, the first one to take the stage determines the voting threshold, which their rival must now beat. The first contestant therefore sings with the screen raised, meaning the second must rise above the bar set by their predecessor in order for the screen to be raised. With these filters in place, the talent pool gradually gets streamlined until the finale. An unwritten television rule mandates that in a sea of competitors, yours must be the first show on the air. Now, with globally-acclaimed formats beating RS to the premiere date, pressure was beginning to mount. RS needed to be ready to launch as soon as possible.31 Also cracking the whip was Keshet International, whose needs mandated that on top of winning the Israeli demographic, the programme should also have global appeal and be an easily-adaptable format. RS’s format is the very epitome of transmedia, joining together content and services; linear broadcasting and online interactive experience. Combined, these elements must form a single, coherent narrative for the viewer to follow, leaving it up to them to simultaneously interact with the online app during the live telecast. More importantly, the ‘Live Test’ is the pivotal moment for the production to make sure that all systems are fully functional. RS background digital infrastructure leans on several technology providers serving as Transparent Intermediaries35 for the viewers. RS launched at the height of the Israeli holiday season. Its first contestant to take the ‘live screen test’ was Orit Bainsay (RS, 1:1.) The app-voting opens. Orit sings as her score gradually ticks up. At 18 percent, Eyal Golan is the first judge to vote (swiping ‘blue’). His image promptly joins others on the big screen whilst the score shoots up to 25%. The remaining three judges soon follow suit, casting a blue vote. Bainsay is at 65 percent and the audition is nearly over. Rita, a female judge, darts to her feet, urging the audience to vote. With 20 seconds remaining, the score is at 66%. Time is up. Bainsay failed to meet the 70 percent threshold. The screen never rises. The judges were all fans but viewers at home evidently were not. Production wise, the inaugural audition was expected to be the proof that the RS concept worked. The failed audition left the control room in shock - had the viewers not got the hang of it perhaps? The second live audition begins. Evyatar Korkus, who will later go on to win the inaugural season, takes the stage. The score quickly reaches 28% when the first judge, Rani Rahav, chimes in, adding his seven percent points. Korkus’s numbers are on the rise and upon hitting the 70 percent threshold with all four judges having now voted for him, the screen rises to loud, climactic rumbling. Finally, Korkus’s audition concludes with an impressive final score of 80%. With the wheels officially in motion, all that remained now was to eagerly await the overnight viewing figures. The programme opened to huge ratings, earning a 32.6% household rating and a 44.7% share, making it Israeli television’s highest-rated launch during a holiday season.37 The results for the full season were even better:38 RS reached a 33.8% household rating and a 47.4% share, ranking #1 in the weekly charts during nine out of its 14-week run. 83% of households were exposed to the programme during its first cycle with the finale earning a 40.3% household rating and a 58% share. Figure 3. Average household ratings per season comparison. Figure 4. Average 12–17 demographic ratings per season. With a hit in the bag and a game-changing format that had already proven successful in Israel, it was time to let Keshet International’s distribution arm take the wheel and roll out RS to the global market. Just a day after the series premiered in Israel, a number of TV executives gathered at the first of several pre-market, closed events. These events, specially-designated for format buyers, offer a first look at all the formats that will later be unveiled at MIPCOM/MIPTV. At the RS presentation, both the promo and the first show results were screened. A commotion soon ensued with eager buyers simultaneously intrigued and aghast at the many digital novelties and the very concept of the live auditions. The stars had aligned. The format was ruled groundbreaking. In the days that followed, the buzz only grew. Video 1. RS International Trailer was produced as a marketing instrument to pitch the format. Basically this is a commercial done entirely to appeal to the hearts and minds of potential buyers. The trailer is mostly shown in private sales meetings (as the ones taking place in the MIPCOM market) or in professional assemblies (like the pre-market pitches). In these events channels’ Heads of Programmes are watching roughly fifty different pitches a day, therefore yours must be the one that stands out. Go to the online version of this article to watch the video. It was a Tuesday, the second day of MIPCOM which also coincided with the latest instalment of RS in Israel. Keshet International’s clients were all invited to a closed event at the Majestic Hotel where they were asked to watch a live RS telecast during which they were also instructed to download the RS app so that they could vote. One of the now-iconic, live screen tests began. Ultra-orthodox Jewish brothers, Gil and Arie Gat (RS, 1: 6) took the stage. Having only become orthodox later in life, the two siblings, each a father of six now, had not told a soul about their upcoming TV appearance. Strapped to their guitars, the brothers began a rendition of Simon and Garfunkel’s The Sound of Silence whilst clad in traditional ultra-orthodox attire – a lasting image if ever there were one. Video 2. The Amazing Rabbis Singing Simon and Garfunkel on YouTube. Go to the online version of this article to watch the video. With focus gained at MIPCOM, the well-oiled, format distribution machine went into high gear. On the market’s opening day, the press was already reporting the locking of RS’s first distribution deal in France with broadcast network, M6. Two more deals would soon follow with Russia’s Rossiya1 TV channel and the biggest deal yet (at the time), with Germany’s RTL. RS was sold to ABC network. Selling your format to a US television network is the pinnacle of a format creator’s dreams. However, it is also a double-edged sword. Win over the American audience and you will have a global hit on your hands with back-end revenues and multiple deals to follow. Strike out, and everything that had been achieved prior to the US version will be at stake. All eyes were now on the US launch. Video 3. Rising Star US ‘Live Test’ Capsule. Go to the online version of this article to watch the video. RS debuted in the US on 22nd of June 2014 at the height of the FIFA World Cup games in Brazil, where the USA’s football team was enjoying great success. With the notable exception of American Idol’s first season which premiered in June 2002, not one of the other major players in the US Reality singing competition genre had ever attempted a summer cycle. Was Rising Star US setting itself up for disaster? Video 4. Rising Star, Shameia Crawford Saved by West Coast, YouTube. Go to the online version of this article to watch the video. RS premiered to 5.1 million viewers, earning a 1.5% rating with the 18–49 demographic. And while its launch was performed modestly at best, the programme did eventually go on to become ABC’s highest-rated summer debut in two years.52 That being said, overall, the season saw a decline in numbers, wrapping with an average of 4 million viewers and a 1.54% demo rating. Digital numbers were solid, though not enough to help make the program a success. M6’s adaptation was perhaps the saddest failure. No expenses were spared and the production surpassed even Keshet’s original version. It seemed that all experience and knowledge gained up until that point went into the development and production of RS’s M6 version. Every element appeared to be in place and in top form: the set, the talent pool, expert panel, production crew, and so on. Therein perhaps lies the format’s saddest story as its genius IT reformatting of the genre ended turning the spotlight directly onto RS’s ultimate failure to reinvent the narrative and premise of the Reality singing competition. Video 5. Rising Star France, Emanuelle Robitaille “I Put A Spell On You”, Audition en Direct, 26-09-14, YouTube. Go to the online version of this article to watch the video. Not all was lost, though. In addition to Brazil, the format was also a success with audiences in Argentina, Hungary, Portugal, China and Indonesia. Also, in terms of a format’s life span, future successes (and failures) in other territories are likely to follow. As much as one is eager to pin down an exact formula for cross-territory format success, such a formula, as of now, remains elusive. Also, neither the presence nor absence of a dominant format in the genre and markets it was launched, could have predicted the rise or fall of Rising Star. Meanwhile, in Israel, RS’s second season was set to roll out and Keshet had decided to scale things back. Costs of the live premiere season, encapsulating its full-on ‘digital estate’ proved excessive to maintain. Many eyebrows were raised when it was announced that the RS second season will go back to pre-recording its auditions. Granted, the app was still involved, albeit on a far lesser scale. Was forfeiting the real-time live-app voting suggesting that the innovation narrative wasn’t sufficient as the format’s premise? It’s a completely new concept unlike anything you’ve ever seen; tonight we are going to change the way you watch television; we’re about to do what no show has done before; put the power to find the next superstar in your hands instantly… Are you ready to find the next music super star? These commonly-heard television hyperboles encapsulate the truth about RS. Admittedly, its employment of the live elements and the accompanying technology had been a first, as had the decision to hand viewers the power from day one. However, it most certainly did not change the way we watch television and above all else, failed to deliver on the most crucial of fronts, namely shaking up the premise of the genre, whose quest to ‘find the next music super star’ had already begun 15 years earlier with Idol, The X Factor, and The Voice. Ultimately, RS failed in harnessing its technological novelties and transmedia-driven storytelling towards challenging and reinventing the genre’s most fundamental narrative premise. A great deal of hindsight wisdom is to be had here. When RS debuted to great fanfare, boasting cutting edge, digital innovation, the scent of magic was in the air. Everyone believed they were looking at a game changer that would reshape the way we watch television. In terms of mass media ideology, RS also stood out as being subversive in allowing the individual at home to play an active role in shaping public discourse from the outset. The tech potential seemed limitless as people began conceiving of a future where even Parliament bills would be voted on using personalised TV/web apps, with the public able to chime in at any given moment. The greater question however, remains: can transmedia narratives or other digital novelties influence our storytelling patterns and tendencies to the point of wholly reimagining our existing dialogue with television? Developing a television format is nothing if not a journey of trial and error. Having been so quick to launch in Israel and with their outmost attention dedicated to the format’s digital novelties, somewhere along the way RS chiefs had simply forgotten all about the narrative premise, leaving it no different to any of its other competitors. And while all the digital novelties touted an overarching coherent transmedia narrative from the very concept of the live auditions to viewer app-interactivity, at no point had anyone stopped to consider whether any of these cutting edge novelties were helping to revive the genre’s master narrative. And so, though initially hailed an earthquake within its genre, Rising Star’s great many novelties were not enough to surpass existing formats, and the programme ended up being no more than a hardly-felt tremour, ultimately failing to challenge the genre’s rule book or its powers that be. A quick overview of Israel’s television landscape reveals three major broadcast networks currently in play: Public service broadcaster, IBA (most commonly known as Channel 1) which launched in 1968 and for many years was Israel’s sole television outlet until the launch of the country’s commercial networks, beginning with Channel Two (1993), and followed by Channel 10 (2002). Channel Two very quickly established itself as the nation’s top broadcast network with Channel 10 enjoying the occasional breakout hit. The latter however, in recent years has been grappling with ongoing financial difficulties which in turn, have led to its rebranding as a ‘serious’ network with a focus on news, documentaries and current affairs programming as opposed to original, scripted, entertainment-themed content. The early 1990s saw the arrival of multichannel television on various cable platforms, all of which would later go on to merge into HOT, Israel’s biggest cable television provider. HOT is currently in direct competition with YES, the country’s main satellite television provider, founded in 1998. Public broadcasting corporation, IBA, once the nation’s exclusive television outlet, failed to catch up with the changing times and is currently in the midst of its biggest, most comprehensive structural overhaul to date. Channel Two is co-operated by broadcast franchisers Keshet and Reshet with each having sole custody of different days of the week. The two, however, co-own the channel’s news company whose primetime edition airs nightly. Interestingly, Keshet and Reshet find themselves in direct competition on various fronts from advertising dollars to Media Buzz but never on ratings, as the two do not air against each other. Despite multichannel television operators’ huge infiltration rates in Israel, the dominance of the country’s major broadcast networks has remained vastly uncontested in comparison to other competitive markets, worldwide. In 2015, the prime time viewing figures indicated that 54 percent went to the broadcast networks while the remaining 46% were split between cable and satellite. 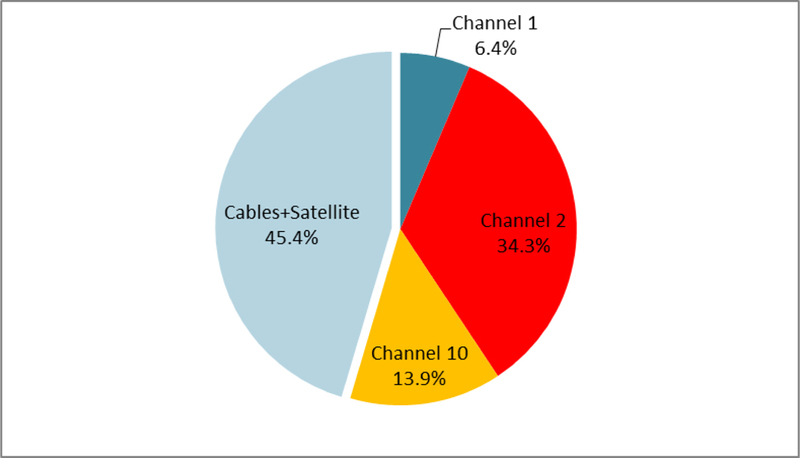 As of now, channel Two continues to maintain one third of Israeli primetime viewership (see Figure 6). Figure 6. 2015 prime time (20:00–23:00) household-viewing-number shares divided between broadcast networks and multichannel operators. Data courtesy of Keshet Broadcasting, based on data provided by The Israeli Audience Research Board. Merav Schiffmann is an experienced TV Creative Director, having worked in the Israeli television industry for the past two decades. Recently, Schiffmann parted ways with Keshet Broadcasting, Israel’s leading, network television franchiser, where she served as Head of Innovation. During her 10-year tenure with Keshet, she gained comprehensive experience working with both traditional and digital departments. Schiffmann founded Keshet’s New Media Research Division and was also Head of Audience Global Research and Insights for the network. Since going down the freelance route, she currently offers a wide range of designated research services to media companies, in addition to developing new formats, collaborating and working with local talent.